KATY PERRY:PART OF ME- Opens in Australia! Aussie Fans Talk! Starring: Katy Perry, Shannon Woodward, Lucas Kerr. Co-Starring: Rachael Markarian, Mia Moretti, Glen Ballard. Directed by: Dan Cutforth, Jane Lipsitz. 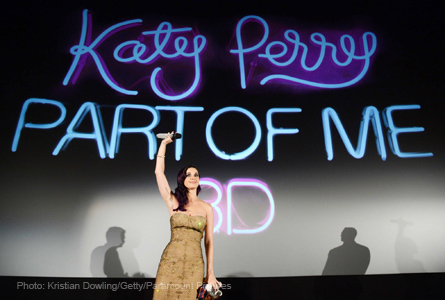 “Katy Perry: Part of Me” – Opens in Australia! Aussie Fans Talk! Katy Perry arrived in Sydney, Australia for the premiere of her 3D concert documentary movie called “Katy Perry: Part of Me” at the George St Cinema where she took time out to sign autographs with fans and take photos. All images and video is courtesy of Paramount Pictures. Australian fans were interviewed about what they think of Katy Perry and what she means to them. Katy Perry (left) poses for photos with fans in Sydney, Austraila. Katy Perry introducing her movie in Sydney, Australia at premiere. Katy Perry (center) poses with fans at Sydney, Australia premiere. Katy Perry at her movie premiere in Sydney, Australia! Katy Perry strikes a red carpet pose at her movie's premiere in Australia. Katy Perry enjoying the scenery in Sydney, Australia! Coming soon from; Insurge Pictures, Pulse Films, AEG Live, Imagine Entertainment, MTV Films, and Paramount Pictures. Rated PG for; some suggestive content, adult language, and brief smoking. Read HOLLYWOOD JUNKET’s article “KATY PERRY: PART OF ME THE MOVIE- WIN FREE Tickets!” To find out how see Katy’s new movie for free. Limited Sneak Peek on Monday, July 2, 2012. Opens in theaters everywhere on Thursday, July 5, 2012.